This is a question I hear on a daily basis in my practice. When a dog bites its owner, there are often a gamut of feelings: shock, disbelief, anger, hurt and sometimes guilt. Often, your first thought or fear is that your dog might have to be given up. However, this is not necessarily the case. Working with your veterinarian or perhaps a veterinary behaviorist like me, you will need to carefully assess the circumstances involved with the dog bite incident in order to decide on the most appropriate course of action. In the immediate aftermath of a bite, you need to ensure your own safety. Stay calm and refrain from overreacting. Physical or verbal reprimands can potentially make the situation worse because your dog may see it as an escalation of aggressive behavior on your part. Try to place your dog in another area of the house, such as a bathroom or the laundry room (assuming he cannot get into garbage or cleaning products). Giving you and your canine space will allow you both a chance to calm down. If you cannot physically place him in another area of the house, walk away and place a physical barrier between yourself and your pet, such as a door. Assess the injury your dog has caused and call your physician to determine whether or not a trip to the emergency room or his or her office is in order. 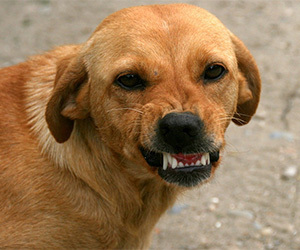 Call your veterinarian to verify your canine is current on his rabies vaccination and to start discussing the incident. How bad was the bite? Did it break the skin? Was it one bite or multiple bites? Where did it happen? In the house, out in the yard, on a walk, etc.? Was another dog, animal or person involved? Does your dog have a medical illness or injury that can cause pain or behavior changes? What was the sequence of events leading up to the bite? How did you get away? Did your dog back away or did you have to use a barrier or walk into another room and shut the door? Did another person intervene? These questions help me determine the prognosis for your dog and the potential for the recurrence of future bites or aggressive incidents. For example, if your dog bit you because you touched him while he was sleeping, the potential for future bite incidents might be managed by not touching him again while he is sleeping or lying down. You should provide a specific location for your dog to sleep undisturbed, such as a crate or bed placed in a quiet location. A dog that has already shown aggressive tendencies when disturbed while lying down or sleeping should not be allowed to sleep in bed with its owner because most people move in their sleep and can inadvertently disturb their dog. On the other hand, the prognosis is poorer if your dog is easily triggered to behave aggressively and redirects the aggression toward the nearest person, regardless of whether or not that person triggered it. The prognosis is also guarded if your dog weighs more than 50 lbs or so (although smaller dogs can still pose a significant threat), or if there are small children in the family and there is potential for your pet to direct the aggressive behavior toward a child. Going forward, part of the assessment of the bite incident must include having your dog examined by your veterinarian to rule out an underlying physical problem, such as pain caused by an infection, injury, arthritis or a medical condition that can make your dog more irritable, such as Cushing’s disease (also called hyperadrenocorticism). It’s possible to overlook the fact that your dog is in pain because he may bear it stoically until touched in an affected area. Also talk to your veterinarian, certified animal behaviorist and/or trainer about whether you can safely attempt to handle the situation yourself with their help, or if you need to take more drastic steps, such as removing your pet from your home. They should be able to advise you on how to deal with your dog’s behavior using techniques that do not involve harsh verbal reprimands or corrections. Punitive or coercive methods increase anxiety and fear; they may potentially cause an escalation in your dog’s aggressive behavior. There is no guaranteed cure for a dog that exhibits aggressive behavior. With management and behavior modification, however, many dogs can learn to be more tolerant and not exhibit such behavior. But remember that not only do you need to alter your dog’s behavior, you need to work on your own behavior, as well. You need to learn to read your dog’s signaling and avoid placing your dog in situations in which he feels challenged. Never attempt to treat your dog’s aggressive behavior without the professional help of a veterinarian, certified animal behaviorist or experienced dog trainer. You need a third party with no emotional ties to professionally assess the safety of the situation and set up an appropriate management and treatment plan — one that does not involve the use of force or punitive measures. You will need to rebuild trust and repair the broken bond with your beloved canine companion.